Summary: A sublime, mesmerising sophomore album from the East London folk-rock outfit. When it comes to acoustic-rock hybrids, these days it seems we have plenty to choose from. From the mainstream folk of Mumford and Sons et al, to the punk-fuelled poetic leanings of Frank Turner, there’s plenty for fans to choose from. There’s nothing, however, quite like Dry the River. Their 2012 debut, Shallow Bed, was a stunning introduction to their highly developed sound, full of unpredictable rhythms, cuttingly emotional lyricism, and incredibly pure vocal melodies. It’s little wonder, then, that their follow-up Alarms in the Heart has been so eagerly anticipated by their dedicated following. There’s little of the sophomore album blues about this spine-tingling ten-track collection. Every track is stunningly executed, bringing back that same blend of haunting melodies and foot stomping beats, scuzzy, lo-fi guitars and the angst to match. The band’s confidence has obviously grown, and with it comes an even greater sense of purpose. While Shallow Bed was as much about stripped back, delicate acoustics as the epic sweeping chords that dragged them into rockier territory, this time they largely avoid those folk leanings. It means that the raw, vulnerable beauty of tracks like ‘History Books’ and ‘Shaker Hymns’ has largely been lost, but instead comes a stadium-ready rock sound that still manages to be deeply personal. Opener and title track ‘Alarms in the Heart’ feels like the bridging track between the two, its acoustic chords and slow, organ-backed opening matching their earlier sound, before building up to ‘Hidden Hand’, and their new sound proper. The previously revealed ‘Gethsemane’ builds beautifully from its choral opening verse, with Liddle’s delicate falsetto pulling the chorus into the truly ethereal, before the guitar riffs kick in to add a grittier edge that pulls us back down to far more earthly territory. While the acoustic elements of their previous work are largely absent, that isn’t to say there that the album lacks diversity. Quieter moments are still to be found, as on the beautiful ‘It Was Love that Laid Us Low’, and the haunting ‘Vessel’, and of course the lyrics, across the board, manage to capture a pastoral vision of modern life, and a wider criticism of modern society. “We didn’t stage a passion play, we didn’t change our given names, we didn’t waltz to our bed, we didn’t need to make a scene” Liddle sings on the latter, at once capturing the simple beauty of his own relationship against the fake pageantry that so often overwhelms others. Every line adds something new, makes you think, or simply stops you in your tracks. It’s the way that songs should be written. 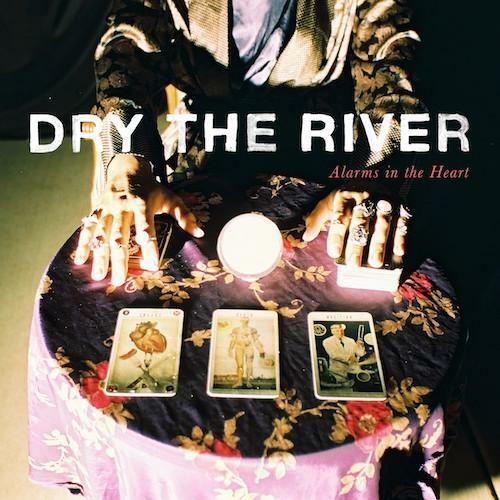 It’s hard to convey in words just how unique a band Dry the River manage to be. Their seemingly unending talent for writing pure, emotional, and ultimately rousing ‘folk-rock’ (although that feels far too reductive a label) has once again resulted in the production of a stunning LP. Alarms in the Heart isn’t just an album, it’s an experience, and it’s one you’ll want to start all over again every time you reach the end. Alarms in the Heart is released on August 25th via Transgressive.